While the idea of creating promotional items seems relatively easy, there are some pitfalls companies should avoid when designing their promotional item campaign. Avoid using items that most people have seen or receive regularly, choose items based on your brand, and give out items that make sense to your target audience. These three rules will help ensure a positive ROI in your swag (stuff we all get) and enhance brand awareness, recognition, and even sales. First things first, we all have 50 branded pens in our desks and junk drawers. We accidentally take them from the bank, we get them from sales reps, car washes, in promotional packets, even in the mail. While there is nothing wrong with pens, they are less likely to make an impact, because they are so wide spread. How can you ensure your promotional items leave an impact? Choose items that are relevant to your brand and remind customers of your product or service. For example, VOSS, a high-end bottled water company wanted to provide a water-themed branded item and came up with branded water floats. The silver and clear pool floats were perfect for their target audience: young and active adults. (AMA) Along those lines, companies in the healthcare field should consider providing health and safety branded products like sunscreen, antiseptic, band-aids, lotion, etc. Companies in the food industry may consider drinkware, coolers, grilling utensils, etc. Coupled with a social media initiative such as requesting photos with the item and use of a branded hashtag, higher-end promotional items can be both effective for brand awareness and customer loyalty. Finding items that match your brand is only half the battle. Researching your target audience and learning what they respond to most will help ensure your promotional products not only land with the recipient but remain in their possession. Use marketing tools such as The Global Advertising Specialties Impressions Study – 2016 Edition which breaks out the most popular promotional items by impact and longevity. For example, branded drinkware is the most popular form of branded item in the Pacific Northwest with more that 61% of consumers in Washington and Oregon owning logoed drinkware. In the Midwest, however, the branded t-shirt is king with 95% of consumers readily knowing who gave them their promotional shirt. Branded health and safety items are more popular among women and 27% of US consumers who own a health and safety product report they carry it with them. Using this type of consumer data coupled with research on popular social and consumer product trends will help you develop the perfect promotional item strategy. 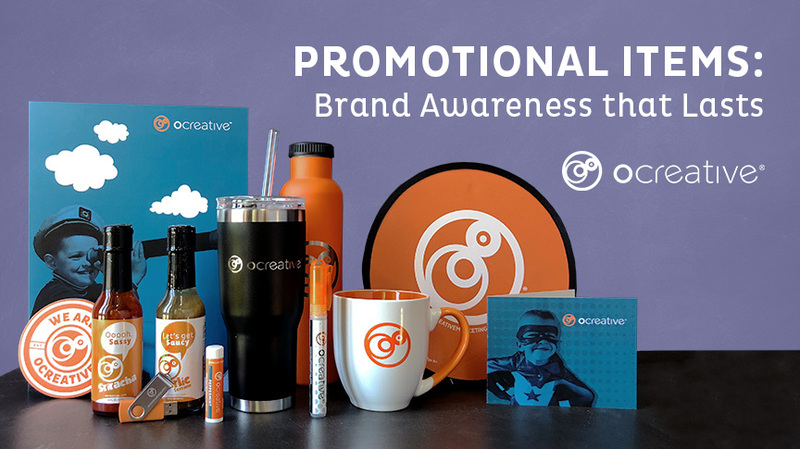 While something is better than nothing, if you are planning to spend money on promotional items, take the time to consider both what is relevant to your brand and what will resonate with your target audience. Most companies may not have large marketing departments to dedicate time and money for research and execution which makes advertising agencies a strong alternative for handling these strategies. Selecting branded items can come with an entire marketing plan depending on your goals and objectives for the campaign. If you are interested in developing a marketing strategy around promotional items, contact Ocreative. Ocreative is a Milwaukee marketing agency, with expertise and broad experience in developing digital marketing strategies, and growing their online presence, for their clients. The company’s core values include offering the highest level of customer service, award-worthy quality, and performance that surpasses client expectations. Ocreative is located just outside Milwaukee, and works with clients locally, nationally, and globally. Their clients have access to some of the most fun and knowledgeable professionals around – ones who inspire, educate, and problem solve. The agency provides marketing and brand strategy, advertising and design, website design and social media, and video expertise to their clients, fulfilling their desire for business growth, and their aspiration to make a mark on their industry.